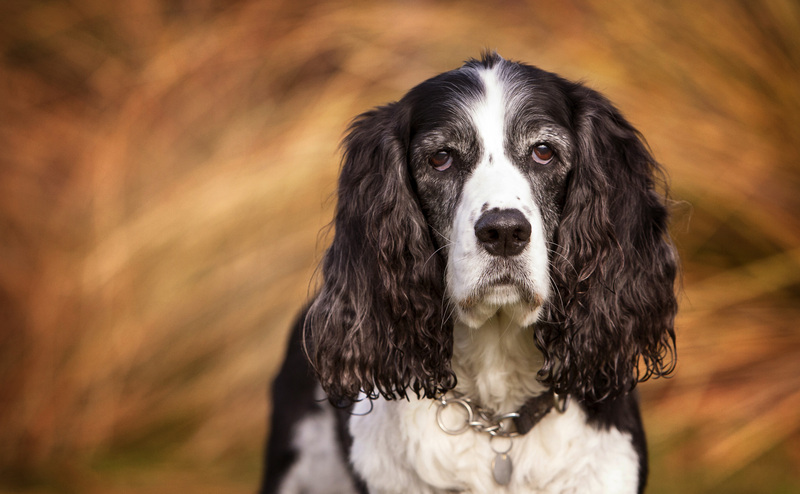 We seem to be photographing a lot of spaniels at the moment and, when you meet several dogs of the same breed in the space of a couple of weeks, it reminds you just how much personality each individual dog has. They may all be spaniels but they certainly aren’t all the same! Lucy was super cute – in her own little world most of the time, enjoying a good sniff, but really engaging with us when we took her action shots. Lucy’s pic of the shoot – the girl can move! Michael took this image. What you can’t see here is me crouching behind the bush to the left of the frame. 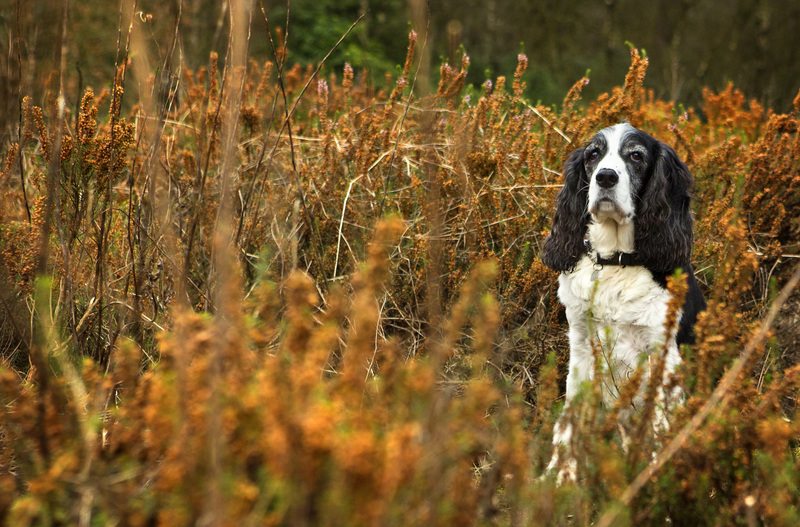 I had to walk Lucy into the undergrowth and wait for the signal from Michael that he was ready to take the shot. 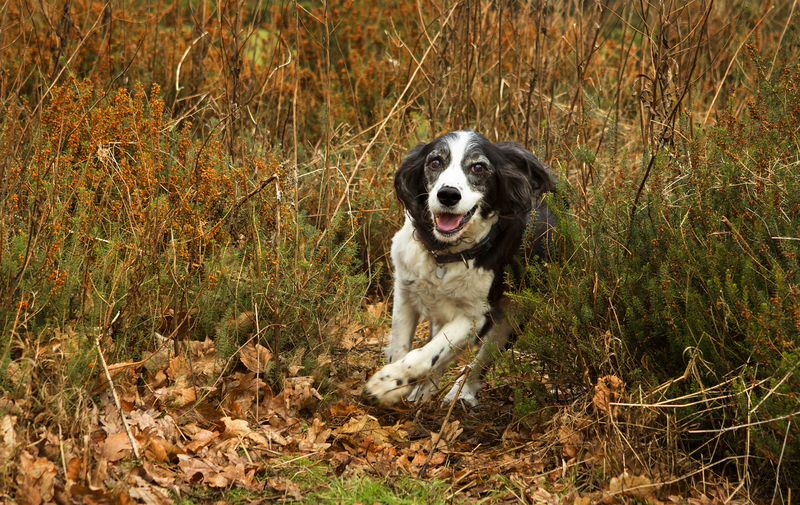 Then I encouraged Lucy to run to her mum, who was calling energetically to persuade Lucy to run towards the camera. You can see from Lucy’s face how much she was enjoying this. She’s almost smiling, knowing that she’s going to get heaps of praise and a nice treat when she reaches her mum’s side. She’s got light in her eyes, which is vital, as she’s heading towards the light source, and she’s leaning as she moves, giving an indication of her speed. With Lucy being both black and white, she presents more of a challenge exposure-wise. It’s possible to lose detail in the whites of her fur in order to pick out detail in the blacks. This is where the balance of light and the correct exposure are really important to obtain a good photograph. We want to see those happy eyes clearly. It’s not difficult to say that we adore our job! 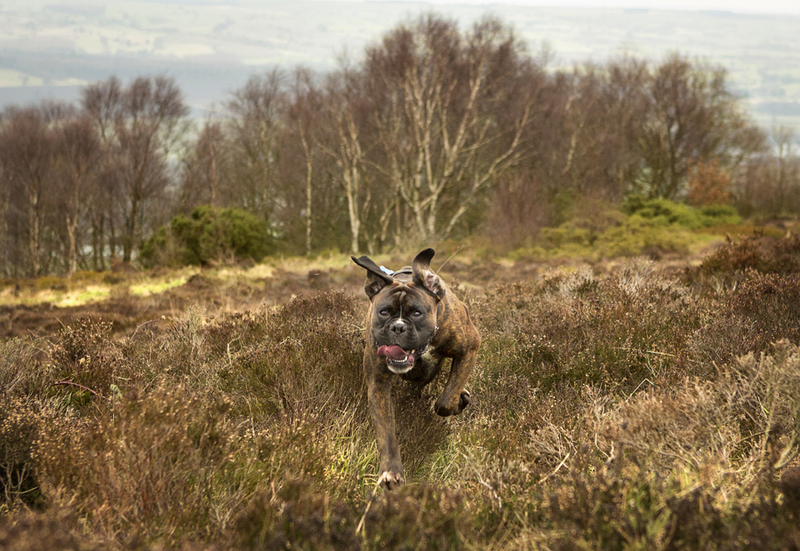 When we plan a mighty pooch photoshoot, one of our key aims is to bring out the personality of the dog we’re photographing. 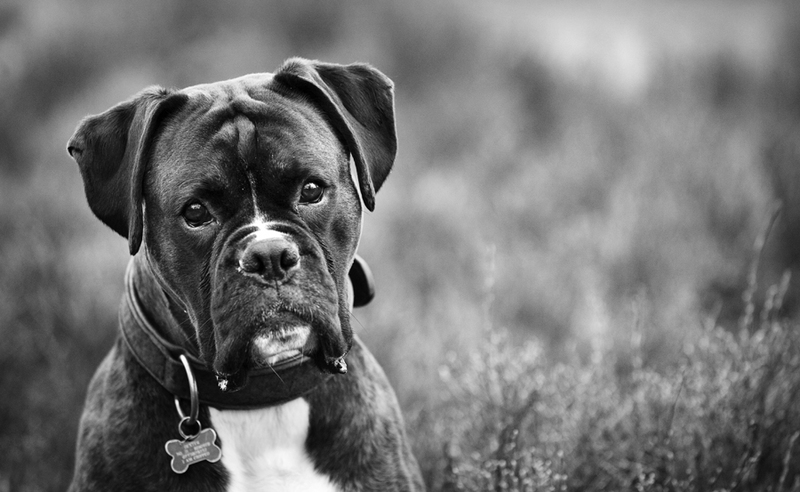 As all we dog lovers know, every single pooch has their own quirks, their own style and their own interests. That’s one of the reasons why we love them so much. Dexter the boxer was no exception. There was a slight worry from Dexter’s ‘auntie’ who had organised the dog photography shoot that Dexter wouldn’t get up to much – that he’d just lope around and not really co-operate. But that was fine with us – we’ve worked with all kinds of dog personalities and we have little tricks up our sleeves to get the images we want. However, Dexter was fantastic. He loved it. 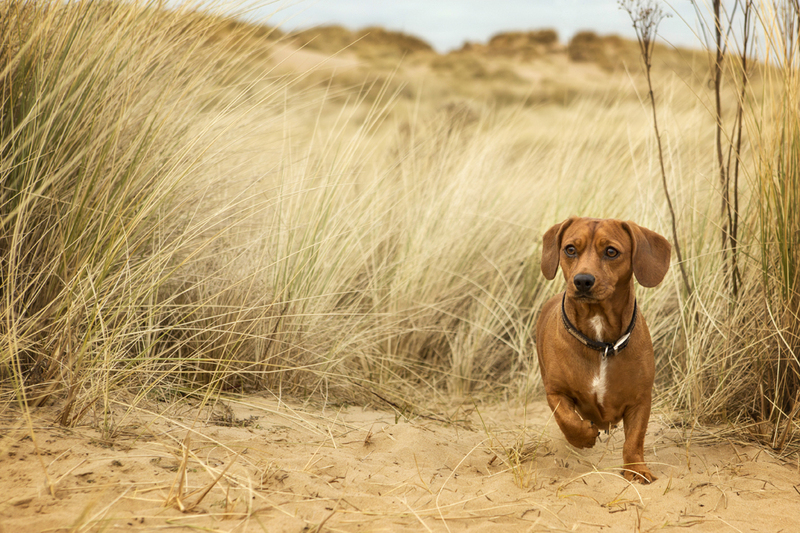 We’re always amused by how much our pooches enjoy their photoshoots – it must be a combination of the fresh air, good smells and abundance of attention and praise. 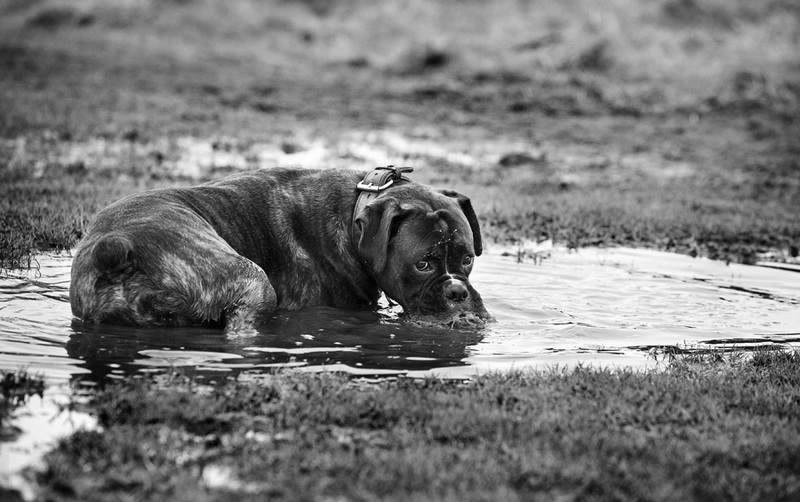 Dexter’s auntie had warned us that when Dexter gets too warm, he likes to chill out in huge puddles, so we knew we had to get the portraits taken first before he heated up and decided to take a dip – basically, we had to get the close-ups before Dexter got very dirty! The first time Dexter took a puddle dip, we couldn’t take the photograph. The light was all wrong for us and the location wasn’t good. We weren’t feeling it. The second time, however, we cracked it and took the black and white shot above. The light was good and the background uncluttered, putting all the focus on Dexter. His position in the water relative to the light is perfect and his expression is great – even the splashes of water round his forehead are reflected nicely in the light. Why do we love this image? The eye contact is great – it’s like he knows he’s been caught in the act, and he knows he’s having a bath when he gets home … but does he care? Nah – not a bit! This is Dexter as Dexter’s family know him – and you can’t beat that. All photographs are copyright of The Mighty Pooch and not to be used without permission from the copyright owners.